Written sources from Viking period Britain create the impression that gold-hilted swords were typical weapons for high status warriors. Alfred the Great (871–99) described royal retainers wielding them; his father Æthelwulf (839–58) gifted one to the Holy See in Rome; and his grandson Eadred (946–59) bequeathed another. In the poem about the Battle of Maldon (991) the golden sword of Byrhtnoth, ealdorman of Essex, becomes a fulcrum of the action – enticing the fancy of a Viking raider who then delivers Byrhtnoth’s doom. The Old English maxim that ‘gold belongs on a man’s sword’ seems to confirm that these weapons were (or at least should be) the norm. Archaeology tells a different story. While gold sword fittings are familiar from 6th and 7th contexts, they are almost entirely absent afterwards. Even the few later hilts with gold ornaments are still largely silver. So, where are the golden weapons of literary fame? Are we to imagine them as ancient heirlooms plucked from the Staffordshire Hoard? Were they, in fact, merely gilded? Did they even exist at all? In 2012, these questions were answered. The Bedale Hoard, found by metal detectorists in North Yorkshire, contained a surprising ingredient. Among the hacksilver and ingots that we have come to expect from a hoard of this period were pieces of a massive iron sword hilt encrusted with gold, along with four solid gold grip bands. The shape of the fittings and the style of their ornament date the weapon to the ninth century. Here at last was a real-life gold-hilted sword from Scandinavian England. But the hilt’s discovery, and its presence in a silver hoard, pose other questions about swords, hoards and concepts of ‘value’ during this turbulent time. My lecture explores the Bedale hilt’s intriguing messages. 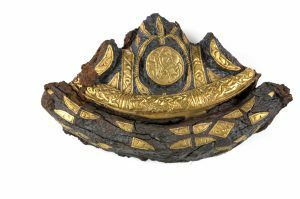 Dr Brunning will give a public lecture entitled From Poetry to Reality: The Gold-Trimmed Sword in the Bedale hoard in the Djanogly Theatre, Lakeside Arts, University of Nottingham, on 21st February 2018 from 1pm. Although the event is fully booked, you can watch the live stream on the Nottingham Lakeside Arts Facebook page, where you can also catch up with many of the previous lectures.